Mexican pre-Hispanic folk black metal band Amocualli from Tuxpan, Jalisco has revealed some info about its upcoming second full-length album. It will be entitled “Nu Kontavi Ña Tzi” which translates to “Under the Shadow of Death” and will be released independently at the end of February 2014. The album comes 2 years after their impressive debut album “Tlayoualotl“. Lyrics speak about the times after the Spanish conquest, describing the courageous local men and women who fought until the end. 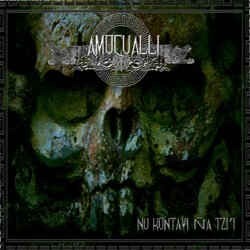 Amocualli have unveiled “Nu Kontavi Ña Tzi” cover artwork and the album tracklist, as well as a first single from the new album that you can listen in their official pages. What’s this language, Mayan ? It’s Nahuatl and Mixtec dialects.